The preservation efforts of Orange County Regional History Center’s One Orlando Collection Initiative continues outside of Pulse nightclub as friends, family members and visitors leave tribute items and condolences in memory of the 49 lives lost at Orlando’s Pulse nightclub, where tragedy struck on June 12, 2016. The One Orlando Collection Initiative is a partnership between Orange County Government and the City of Orlando. To date, Orange County’s History Center estimates that they have collected nearly 5,000 pieces, curated from the numerous memorials established throughout the region. “The thousands of hand-written notes, paintings, personal tokens of love, signs, photos and messages from across the globe will give the community and future generations just a glimpse at the displays of kindness and condolences that came in support to this entire community, as well as those directly affected by the tragedy,” Orange County’s Regional History Center Manager Michael Perkins said. With assistance and input from numerous community stakeholders and partners, the community is united by the shared goal of expanding our understanding of the events of June 12, 2016, and to documenting the impact and legacy of the Pulse tragedy, when a gunman killed 49 people and injured 53 others. It is considered the deadliest mass shooting by a single gunman and the deadliest incident of violence against the LGBTQ community in modern U.S. history. The Pulse tragedy is also considered the deadliest terrorist attack in the United States since the September 11 attacks in 2001. To preserve memorial items for the long-term memory of our community and to create a comprehensive historical record for current and future generations, Orange County’s Regional History Center is regularly photographing, cataloging, removing and preserving the tribute items and mementoes from the public memorial sites throughout Central Florida. The Center serves as the repository and caretaker for the physical tribute items, which will be collected and handled with great dignity. The collection includes large, very public displays of condolences including the 49 white tribute crosses from Orlando Regional Medical Center and an iconic IKEA sofa which was placed at the Dr. Phillips Center of Performing Arts memorial site that is now covered in signatures and messages of love. Among the thousands of tribute items is a rosary from the Vatican, which one woman left in memory of the victims. As the woman later explained, she did not have the funds to buy something of monetary value as a tribute, so she contributed her rosary, which had profound meaning to her. On July 18, Orange County Regional History Center staff completed their One Orlando Collection memorial efforts at the Dr. Phillips Center for the Performing Arts’ Seneff Arts Plaza. The Orange County Facilities Management team worked tirelessly alongside of the History Center staff to manage the dignified and careful removal of thousands of deteriorated flowers from the memorials related to the Pulse tragedy. The flowers were collected and moved to Leu Gardens, where through composting, the flowers organically transformed into soil used to nourish the gardens throughout the City of Orlando. A group of uniformed scouts from the Central Florida Council, Boy Scouts of America, conducted the honorable removal of hundreds of American flags from the site, along with Puerto Rican and other official flags that were properly retired by the American Legion. “Those who pass by and see the collection efforts seem to find great comfort knowing that these pieces were left out of love and are being cared for with complete care and sensitivity – and always will be,” Museum Curator Pamela Schwartz said. 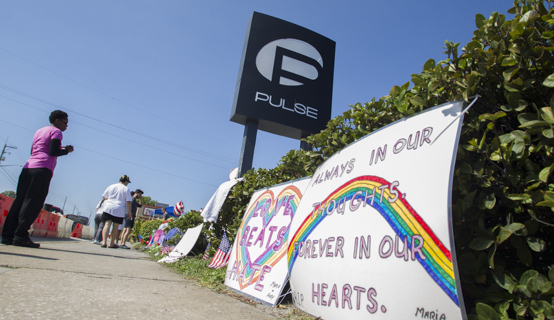 Orange County’s Regional History Center will also be collecting other items related to the Pulse tragedy, including photographs, digital memories, videos, spoken stories, social media postings, artwork and other remembrances, so these memories will be available for future generations.